This awesome wildlife rescue happened back in October, 2010 in Taku Inlet near Juneau, Alaska. Alaska Quest Charters was crossing the inlet when four deer approached the boat about a mile offshore. The struggling animals were brought aboard where they recuperated. When they reached the opposite shore, three of the deer took off into the forest. The fourth had to be rolled off with a wheelbarrow, but after a couple hours was able to take off as well. “About a mile offshore, Sharon, a birder, spotted something odd in the water coming towards the boat through her binoculars. What she first thought were sea lions or shorebirds turned out to be four young Sitka black-tailed deer (a subspecies of mule deer). 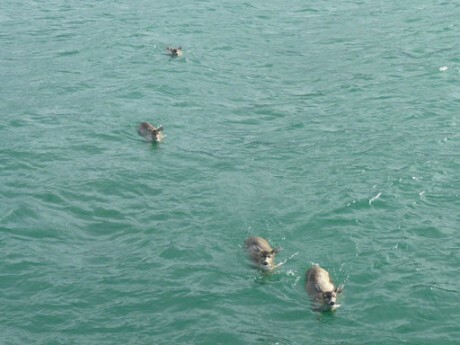 Even though Sitka deer are known for their swimming ability and often cross large bodies of water between islands, these four where in obvious distress in the frigid water and whipping winds that had stirred up two to three foot swells in the inlet. 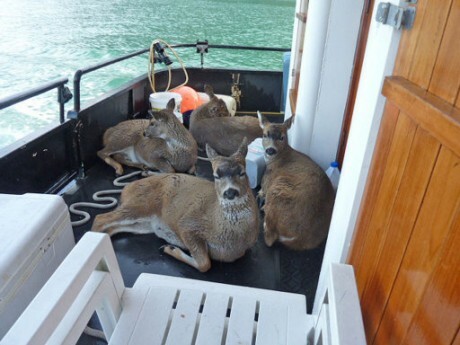 The biggest sign of that distress was the fact that the deer actually swam towards the boat and tried to board it, their fear of drowning overpowering their fear of people.